Located in East London, Absolute Vintage is the place to head if you have a thing about shoes. It is situated quite close to Old Spitalfields Market which is also an excellent option if you want a market with a variety of items. Shoes here start at around £20 per pair and although it’s unlikely that you’ll unearth a treasure, there is a huge selection of cheap, vintage shoes meaning you are sure to find something to take home. The store does also sell bags, accessories and clothing for men and women but it isn’t one of the best stores for clothing. Alfies is London’s largest indoor market of its kind and is stuffed to the rafters with vintage clothing, antiques, furniture, collectables and 20th-century pieces. There are more than 70 dealers who regularly sell here and it’s a real treat for anyone who loves admiring vintage items to spend a couple of hours just browsing all the different items available here. There is also a café which is located up on the rooftop of the market and which offers stunning panoramic views across London; the perfect place to take a pitstop before you head back to engage in some haggling. Another offering in East London; and perfect if you are staying at the M by Montcalm Shoreditch London Tech City Hotel, Beyond Retro can be found on Brick Lane, although there are now also two other stores in Soho and Dalston as well. Beyond Retro is one of London’s premier stores for vintage items and it now even has its own fashion label for re-purposed vintage items. You can find clothes, shoes, antique accessories and shoes here and the prices are fairly reasonable too; expect to pay around £15 for a dress and £17 for a pair of shoes. Another option to consider if you are staying in East London and taking advantage of one of the special offers on Shoreditch hotels is Blitz. This is a huge store located in Shoreditch and it is housed in a large Victorian warehouse which was converted to become the world’s first vintage department store. You’ll find absolutely everything vintage here including books, homeware, clothing and art. The shop particularly focuses on items from the 70s, 80s and 90s but there is a vast vintage collection here which you could happily spend hours rummaging through. There’s also a coffee shop if you need to take a break and consider your purchases before continuing on. Open all week long, Camden Market is a bargain hunters dream with more than 200 stalls setting up each day selling their vintage wares. 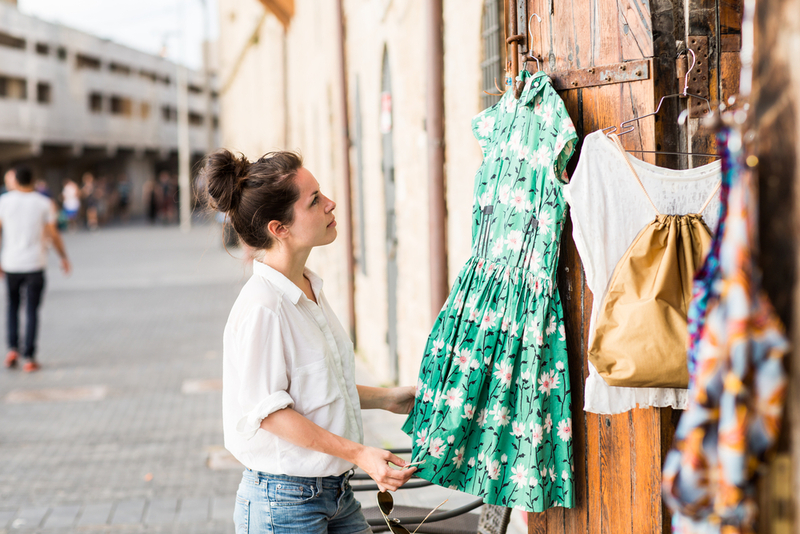 Not only are there plenty of stalls to explore but there are also a number of independent stores and second-hand shops dotted around the market as well so you could easily spend the entire day here hunting for treasures. Whether you are on the hunt for a vintage party dress, 80s inspired disco wear or a unique one-off piece of jewellery, there is every possibility that you will be able to find it at Camden Market. Many of the sellers also sell their own designs and products alongside the vintage items too and there are also plenty of coffee shops, cafes and restaurants in the immediate vicinity of the market. One of the smaller vintage shops in East London, the House of Vintage is still worth a visit, especially if you are looking for more unique items. The shop predominantly sells items from the 1940s-1960s but there are items which date back to the 1920s plus more modern additions as well. One of the things which makes this particular shop stand out is that is also caters to brides; the Vintage Bridal showroom here has some of the best vintage wedding dresses in the whole of the city, and it is fairly reasonably priced too. If you like your vintage items to come with a name then you must head to One of a Kind on Portobello Road. This store stocks pieces by designers such as Lagerfield, Chanel, Hermes, Gucci and Vivienne Westwood and it also has a pretty impressive list of celebrity shoppers who regularly frequent ‘The Back Room’ including supermodels such as Kate Moss. If you are looking for a truly one of its kind or rare item then this store is a must; although try not to blanch at the accompanying price tags. If you time your visit correctly you can also follow up a visit here with a trip to the very popular Portobello Road market which is also popular with vintage lovers. Rokit has four shops across the city; two in Shoreditch, one in Camden and one in Covent Garden and although the stores are smaller than the likes of Beyond Retro and Blitz, they still have plenty to offer. Rokit has its own fashion label which restores and re-purposes vintage items but it is perhaps better known for stocking alternative fashion. One of the more recent additions to the vintage shopping scene, Vintage Heaven has only been open for a short time but there is plenty to be discovered here, if you don’t mind a bit of a rummage. It is also located on Brick Lane and regularly runs sales which means you can pick up some real bargains so it’s always worth a visit if you are in the area.